Hey guys, I'm beginning my own screenpack for M1 called Anime CAW: Bragging Rights. So I began messing around with the default motif. Took me a couple of hours to make it look right but the expansion looks pretty good. The new select screen holds 390 chars. 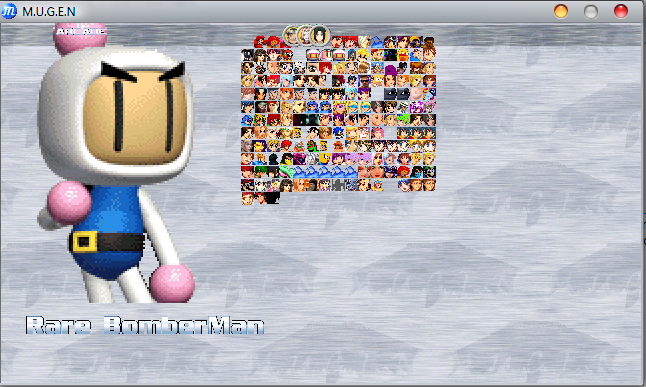 I made it to work specifically for HD, but if your PC can't handle HD, set the Mugen Window Size to 640x360. I also changed the name of the menu items to reflect the SP i'm workin on. The Download comes with system.def and select.def. Extract the files to "data" and modify mugen.cfg to use the system.def in the Mugen1mega folder.